New England is made up of 5 colonies, Massachusetts Bay, Connecticut, Rhode Island, Providence Plantations, and New Hampshire. Back in England there was a popular religious group known as the Separatists. They wanted to seperate from the English church so they fled to Holland. 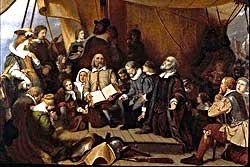 Shortly after going to Holland they approached Jamestown, Virginia and were welcome into the religious freedom. Jamestown was originally founded by the King to help bring wealth to England. It was the first settlement in New England. New Hamshire was formed by Jhon Smith, who used to lead Jamestown. He was exploring when he found the place where New Hampshire was set up and started a colony here. As said in the paragraphs above there was much religious freedom in New England, and actually all over the 13 colonies. This was the main reason that people signed up to the colonies. The religious freedom was the main goal of all the pilgrims and settlers, but the kings main goal for setting up New England was money. He wanted New England to have a good economy and help make England's wealth go, which in the end it did help immensely. New England is also very close to the Grand Banks. All of New England was controlled by the king of England. If they wanted a new settlement or food, or something like that they had to ask the king. The religion here is mostly a diversity because religious freedom is accepted here. It was also one of the main reasons that New England was from along with wealth. New England was mostly made up of Paritains, Seperatists, and a few others. Education was a very high standard for the puritans so that people had literacy to be able to read the bible. As said above the winters in New England where much harsher because the colonies where farther north. Not to mention that the ground was quite rocky. This made it harder to find plots of land you could use for crops. Because of this there were very few farmers in New England. There was, however, and immense amount of trees and wood. The colonists here built many ships and often fished and hunted whales. With all of their ships, New England became the leader in ocean-shipping/ Commerce of all the colonies.